And like a sucker, I just got a damn Black Berry. 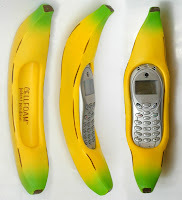 If you are still cool enough to have a regular style phone like the one shown above, then I would head over to Cellfoam as soon as humanly possible, because nothing will make you cooler faster. But make sure you get the holster, otherwise you'd just look silly.